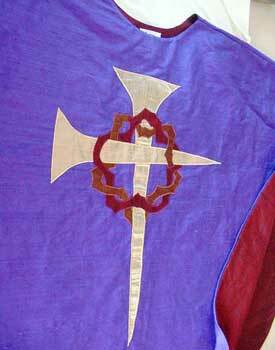 Every chasuble we fabricate is a unique, hand-made creation crafted from 100% Dupioni silk. Dupioni is a plain weave silk fabric made from yarns that create a highly irregular, slubby surface. The slubs are not defects in the material. Dupioni is known for its elegant luster and small fabric samples can be sent on request. 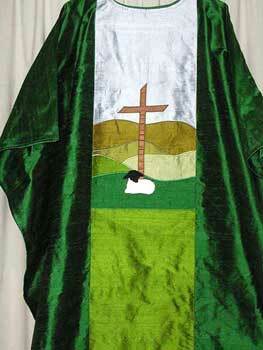 Each chasuble is custom made to your measurements. 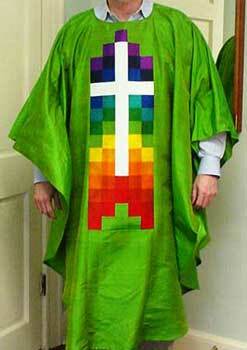 We will be happy to answer any questions you may have as to sizing a chasuble properly to best fit the wearer. 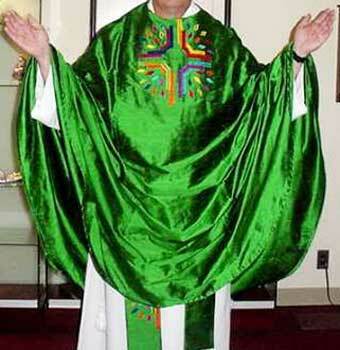 Chasuble prices start at $500. We will be happy to work with you to design exactly what you need and what the cost will be. When you place your order we will give you a time frame of when to expect your finished product. If your order is first on the list and all fabrics are in stock, your order will normally take approximately 4 to 6 weeks, depending on the complexity of the design. Please specify if you need a project by a certain time and we will let you know if we will be able to meet that deadline. Rush orders are available for additional charge. Items are shipped by United States Postal Service. Actual shipping charges will apply. Most items can be shipped for around $5.50 by USPS priority mail. Overnight shipping is available to most areas for an additional charge. We will notify you of any additional shipping charges based on the delivery zip code. 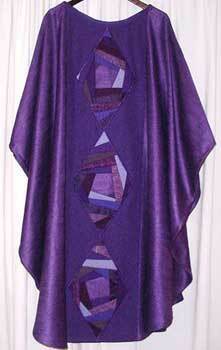 These are some of the standard chasuble designs we have created. We will be happy to create a custom design specifically for your needs. 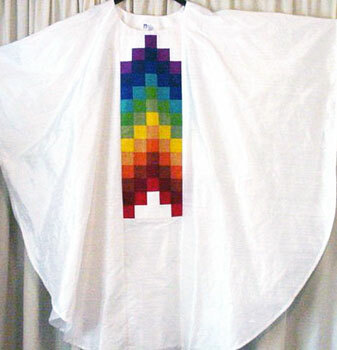 Just contact Annette to get your custom chasuble started.